देश में दवाओं की बेतहाशा कीमतों के खिलाफ़ उत्तर प्रदेश हाईकोर्ट में जनहित याचिका दायर की गई है, जिसकी सुनवाई 10 सितंबर को होनी है. वहीं मुम्बई की ‘प्रतिभा जननी सेवा संस्थान’ भी कंट्रोल एमआरपी की एक मुहिम पूरे देश में पिछले 3 महीने से चला रही है. फिल्म अभिनेता आमिर खान के शो ‘सत्यमेव जयते’ में भी महंगी चिकित्सीय सेवाओं का मुद्दा उठाया गया था. आमिर खान ने जेनेरिक दवाओं के मुद्दे को भी उठाया था. इसी बीच BeyondHeadlines ने देश में दवाओं की कीमतें निर्धारित करने के लिए बनाई गई नेशनल फार्मा प्राइसिंग अथॉरिटी (एनपीपीए) को सूचना के अधिकार के तहत आवेदन देकर कुछ बुनियादी जानकारियां जुटाने की कोशिश की. एनपीपीए ने सभी सवालों के पूरे जवाब तो नहीं दिए, लेकिन जो आधे-अधूरे जवाब दिए उनसे भारत में बेवक्त मर रहे लाखों लोगों की मौत का कारण ज़रूर पता चलता है. आपको यह जानकर हैरानी होगी कि देश में दवाओं की कीमतें निर्धारित करने के लिए बनाए गए इस प्राधिकरण के पास देश की तमाम दवा निर्माता कंपनियों की सूची तक नहीं है. यही नहीं एनपीपीए को यह भी नहीं पता है कि भारत में कितनी दवा कंपनियां जेनेरिक दवाएं बनाती हैं. यानि भारत में दवा की कीमतें निर्धारित करने की जिम्मेदारी जिस प्राधिकरण को दी गई है उसे यह तक पता नहीं है कि देश में कितनी कंपनियां दवाइयां बनाती हैं. साथ ही देश के विभिन्न ड्रग इंस्पेक्टरों से मिलने वाली शिकायतों की भी सूची एनपीपीए नहीं बनाती है. यही नहीं, अभी तक किसी भी फार्मा कंपनी को ब्लैकलिस्ट भी नहीं किया है. BeyondHeadlines के सवालों पर एनपीपीए ने क्या जवाब दिए आप खुद ही नज़र डाल लीजिए. 1. देश में कितनी दवा कंपनियां है? उनके नामों की सूची उपलब्ध कराएं. Reply: There is no list of the names of Drugs/Pharmaceutical companies available with NPPA. However, pharma directory placed on website i.e. www.nppaindia.nic.inin this regard may be visited. 2. देश की कितनी दवा कंपनियां जेनरिक दवा बनाती हैं? कम्पनियों के नामों की सूची उपलब्ध कराएं. Reply: There is no list of companies manufacturing generic drugs is available. 3. दवा कंपनियां अपनी दवाई का कॉस्ट ऑफ प्रोडक्सन कैसे तय करती हैं? इस संबंध में समस्त जानकारियां उपलब्ध कराएं. Reply: In respect of scheduled formation under price control, the prices are fixed by NPPA as per the formula given in paragraph 7 of the DPCO’1995. In respect of medicines not covered under price control under the DPCO’1995 i.e. non scheduled formulations, manufactures fix the prices by themselves without seeking the approval of the Govt. /NPPA. Under the present framework of pricing, there is no control on the launch price of non-scheduled medicines. 4. किसी दवा का एम.आर.पी. कैसे निर्धारित होती है? इस संबंध में समस्त नियमावली का सूचियां उपलब्ध कराएं. Reply: The MRP of a schedule drug formulation is fixed after adding the statutory duties like excise duty, VAT / taxes etc., as applicable, to the price determined as per paragraph 7 of the DPCO’1995. 5. कोई कंपनी अपने कॉस्ट ऑफ प्रोडक्शन से कितना प्रतिशत ज्यादा एम.आर.पी. रख सकती है? इस संबंध में सरकार द्वारा जारी गाईडलाइन्स की कॉपी उपलब्ध कराएं. 6. जेनरिक दवा का एम.आर.पी. उसके लागत मूल्य से अधिकतम कितना प्रतिशत ज्यादा रखा जा सकता है? इस संबंध में सरकार द्वारा जारी गाईडलाइन्स की कॉपी उपलब्ध कराएं. Reply: In the case of indigenously manufactured scheduled formulation, the Maximum Allowable Post-manufacturing Expenses (MAPE) to cover all costs incurred by a manufacturer from the stage of ex-factory cost to retailing and includes trade margin and margin for the manufacturer shall not exceed 100% as per paragraph 7 of DPCO’1995. In the case of an imported scheduled formulation, such margin to cover selling and distribution expenses including interest and importer’s profit shall not exceed 50% over the landed cost of the formulation under the said paragraph. DPCO’1995 does not specify the percentage of margin over the cost of production of the company in respect of non-scheduled formulation which is not under price control. The above information given for scheduled and non-scheduled formulations is also applicable for generic medicines as there is no separate provision for generic medicines under DPCO’1995. 7.दवाइयों का मूल्य कंट्रोल करने की दिशा में शुरू से लेकर अब तक क्या-क्या कार्य किए गए हैं? अब तक इस संबंध पिछले दस सालों में जितने भी पत्राचार किए गए, सभी पत्रों की फोटोकॉपी उपलब्ध कराएं. Reply: The prices of scheduled Bulk Drugs and scheduled formulations are controlled by NPPA under DPCO’1995. No one can sell any scheduled drugs/ formulations at a price higher than the price fixed by the NPPA / Government. NPPA initiates actions for overcharging based on the report from State Drug Controllers (SDC), complaints from individuals, verification of price list submitted by companies and suo-moto purchase of samples from market. In case, a company is found is found selling the drugs/ formulations at a price higher than the prices fixed by NPPA/ Government, NPPA initiates action by issuing Preliminary Notices to the Pharma companies seeking requisite information/details from them to examine the matter further under para 13 of the DPCO’1995 read with Essential Commodities Act-1995. In confirmed cases of overcharging, demand notices are issued to the defaulting Pharma companies for depositing the overcharged amount with the Government. The prices of non scheduled formulations are not fixed by NPPA. As a part of the exercise for monitoring of prices for non-scheduled formulations exceeding 10% per annum. In case a company increase the prices of non-scheduled formulations beyond 10%, the specific cases are taken up by NPPA with the respective companies for rolling back the increase within the limit of 10%. In case, a company does not comply with the instructions as above, NPPA initiates the process for capping the increase in the prices upto a ceiling of 10% by fixing the price of respective formulation pack/medicine. Notifications/ price fixation order for scheduled and non-scheduled formulations issued by the NPPA from time to time and other relevant information are available on the website of NPPA i.e. www.nppaindia.nic.in. On the part of monitoring exercise, NPPA has fixed prices of 30 non-scheduled formulation packs under Para 10(b) and in the case of 65 formulation packs, the companies have voluntarily reduced the prices of formulation packs as a result of intervention of the NPPA. 8. जेनरिक स्टोर खोलने की दिशा में सरकार की नीति क्या है? समस्त जानकारी उपलब्ध कराएं. Reply: information with regard to opening of Generic store is not available with NPPA. It is however stated that the Jan Aushadhi Stores are opened under Jan Aushadhi Campaign of the Department of Pharmaceuticals. 9. एन.पी.पी.ए के पास दवा कंपनियों के खिलाफ कितने मामले लंबित है. सारे लंबित मामलों की जानकारी सूची सहित उपलब्ध कराएं. 10. लंबित माललों को निपटारे के लिए एन.पी.पी.ए ने क्या क़दम उठाये हैं. समस्त जानकारी उपलब्ध कराएं. 11. अभी तक कितनी कंपनियों पर ओवरचार्जिंग के केस हैं. और वे कौन-कौन हैं? कम्पनियों के नामों की सूची उपलब्ध कराएं. Reply: Action for recovery of the overcharged amount along with interest thereon is a continuous process for which action is taken by NPPA as per the provision of DPCO’1995 read with Essential Commodities Act, 1995. In case the amount is not deposited by the companies, the case is referred to the collector of recovery of the demanded amount from them as arrears of land revenues under the provisions of DPCO, 1995 read with Essential Commodities Act, 1995. The recovery of the overcharged amount is affected due to various Court cases in High Courts and Supreme Court. The details of companies penalized for overcharging alongwith interest thereon vis-à-vis amount realized form them since inception of NPPA and till 31.07.2012 are available on the website of NPPA at www.nppaindia.nic.in. 12. पूरे देश में किस जिला, राज्य में दवाइयों की रैंडम सैंपलिंग के लिए सबसे ज्यादा भेजा गया है? समस्त जानकारी उपलब्ध कराएं. Reply: Most of the random sampling has been done from Delhi/ New Delhi during the current year. 13. किस ड्रग इंस्टपेक्टर ने अब तक सबसे ज्यादा दवाइयों को जाँच के लिए भेजा है. देश के सभी ड्रग इंस्कपेक्टरों द्वारा जांच के लिए भेजी गई दवाइयों के कितने मामले हैं? समस्त जानकारी उपलब्ध कराएं. Reply: NPPA has been receiving the complaints along with the details of products, samples etc from different State Drug Controllers (not from the Drug Inspector). Maximum number of complaints/ samples for examination is receiving from Gujarat and Kerela Drug Controller. 14.क्या कोई दवा कंपनी बिना एन.पी.पी.ए को सूचित किए दवाइयां बना सकती हैं और उनके मूल्य निर्धारित कर सकती हैं? अगर हां, तो ऐसी कई कम्पनियां इस देश में हैं. और अगर नहीं, तो आपके विभाग ऐसे कम्पनियों का मामला उजागर किया जो नकली दवा बना रहे हैं. समस्त जानकारी उपलब्ध कराएं. 15. नकली दवा बनाने वाली कम्पनियों के कितने मामले आपके विभाग में आए हैं. नकली दवा बनाने वाली समस्त कम्पनियों के नामों की सूची उपलब्ध कराएं. Reply: The pharmaceuticals company manufacturing medicines shall have to follow the DPCO’1995 in the matter of fixing price for the scheduled medicines manufactured by them. In case of non-scheduled formulations, manufacturers fix the prices by themselves without seeking the approval of the Govt./NPPA. Under the present framework of pricing, there is no control on the launch price of non-scheduled medicines. 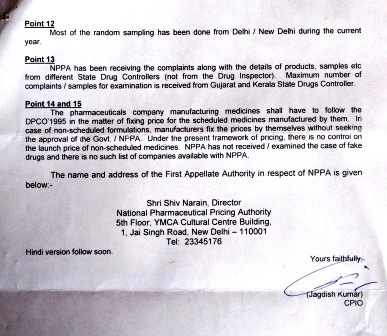 NPPA has not received/ examined the case of fake drugs and there is no such list of companies available with NPPA.